If you think the Parking Industry isn’t exciting…think again! 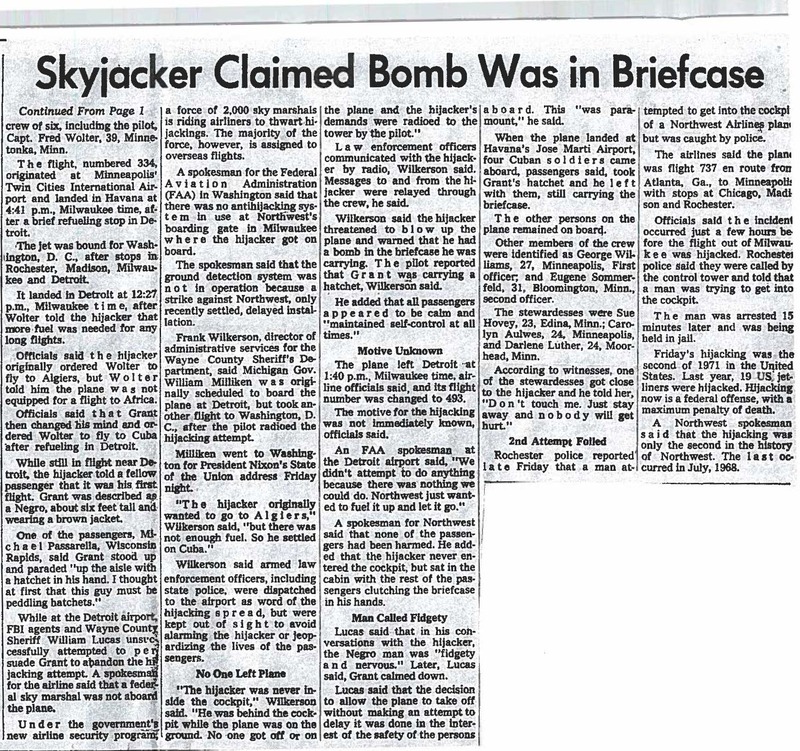 “A Northwest Airlines jetliner returned safely to Miami after it was hijacked from Milwaukee to Havana, Cuba, with 60 passengers aboard, by a man armed with a hatchet and claiming to have a bomb hidden in his briefcase“. This is the opening line to an article published in the 1971 edition of the Milwaukee Sentinel. One of those 60 passengers aboard the hijacked flight to Cuba was our very own president, Richard C. Rich. We’re back this month with another one of his once in a lifetime stories from his first 55-years at Rich & Associates. If you thought the Parking Industry wasn’t exciting…think again! “The plane, a Boeing 727 landed in Miami after being in control of the hijacker for about 8 hours. Architect Richard C. Rich, 39, was on his way home to his suburban Detroit home from Nicaragua, where he is doing Architectural work, when he stopped in Milwaukee Thursday to visit his parents”…Here is what Richard C. Rich recalls from his unplanned and unexpected trip to Cuba! “People may think it’s pretty boring doing parking garages but being in the industry has really afforded me some experiences that otherwise couldn’t be. One of the most exciting was a return trip from a project in Nicaragua. I decided to stop in Milwaukee, Wisconsin to visit my parents on my way back to Detroit from Nicaragua. 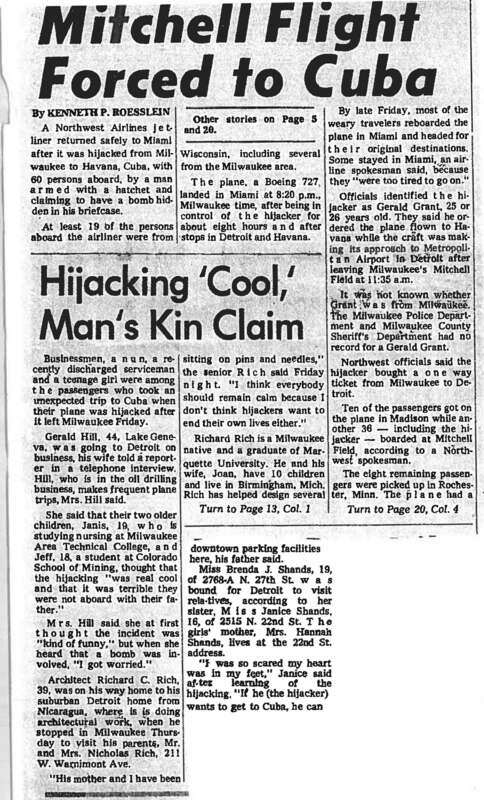 I spent the night in Milwaukee and my parents drove me to the airport the next morning. I got on the Northwest flight to Detroit, sat in the second row in first class and the plane took off. Some of the people in first class with me left for the back of the airplane once the hijacker approached our section. Two or three of us remained in first class. I figured I paid for first class so I might as well stay there, since it wasn’t going to be any different in coach. But I seemed to be the best target sitting in the second row so I asked the hijacker if I could move a couple of rows back and he said ‘OK’. When we landed in Detroit there was quite a bit of discussion on the plane. The captain parked the plane in a field far away from the terminal and I could see activity around the airplane from my window. The captain and one of the crew came back to talk to the hijacker when he said that he wanted to go to Algeria. They explained to him that we were on a Boeing 727 and that this plane didn’t have enough fuel, even with a refill, to get to Algeria. So they asked him if he had a second choice like Cuba, and he said ‘yes’. The plane was refueled and we left for Cuba. I don’t remember much discussion after that. I usually carried a small camera on my business trips and I kept thinking ‘he appears to be accommodating enough to respond to us, I bet he would let me take his picture standing there with the hatchet and the briefcase’. But as chance would have it, my camera was packed away in my checked luggage. When we landed in Havana, the Cuban authorities got on the airplane and the hijacker handed over the hatchet and briefcase. When they opened up the briefcase and handed it back to him, we all realized that there was no bomb. The Cuban authorities took the hijacker off of the airplane, and the next thing I knew we were ushered off of the airplane into immigration. We were questioned regarding our names, occupations, addresses, and a few other things. We were then ushered into a room that looked like it could’ve been a cafeteria. They were walking around selling some cigars and cigarettes, and we eventually had a meal. One of the flight attendants came over to my table and said ‘you better enjoy the meal, it’s going to be the most expensive meal you’ve ever had.’ She said that over in the corner there was somebody from the Swiss Embassy negotiating with the pilot for a ransom to be paid for the airplane to take off and I recall her saying it was going to cost something like $200,000.00!